Florence Welch of Florence and the Machine performed live on stage as part of the Debit MasterCard Priceless Music Show at the Seymour Centre earlier today in Sydney, Australia. 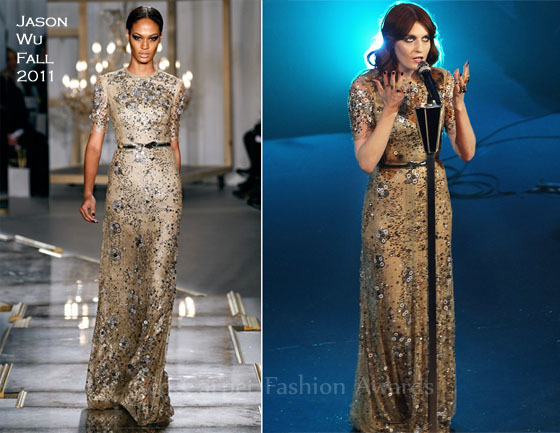 The British singer makes my dreams come true by wearing this breath-taking Jason Wu Fall 2011 gown. It was worth the wait because she looks stunning in this gold lace paillette embroidered gown which she wore with the same gold bow accented belt. With her flame red hair styled in retro waves, the singer opted for dramatic makeup, gold rings on every finger and a pink lip colour. I know some designers hate to see looks worn twice by a celebrity, but I would still love to see this on the red carpet.